The Aural Symphonics Chrono b2 is more a study in contrasts than most cables. Chrono b2 refers to balanced version 2. Visually, it is a large diameter cable covered in an outer jacket that appears black with a diamond pattern etched in white thread, rather unexceptional, but functional. At night, in a darkened room, it undergoes a rather remarkable visual transformation as what appears to be black in normal light is revealed instead as a highly reflective skin that becomes bright white. Likewise, judging solely by its appearance, you would expect this cable to be heavy and relatively stiff. In reality, it is quite light, reasonably flexible and easy to use. Not surprisingly, there was also a marked contrast between the sound in early listening sessions before the cable was thoroughly broken in and that in later sessions, but more on that later. First, a brief description of its construction. 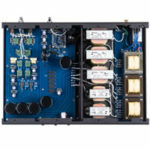 Chrono b2 is the current top-of-the-line interconnect at Aural Symphonics. All conductors and connectors are immersed for 72 hours in a deep nitrogen bath at minus 310 degrees Fahrenheit during manufacturing process. The positive conductor is configured as multiple un-insulated solid core wires. The negative is a smaller conductor. Although there is no outer shield, the Chrono b2 has an extremely low noise floor with sounds emerging from what is essentially an intensely black background. Doing away with the outer shield apparently eliminates the need to use any additional resistive load on the ground. Although the manufacturer does not specify the dielectric (other than air), the literature does mention that no crushed polypropylene filler is used in its construction. All Chrono b2 are hand assembled and made to order using a 4% silver solder. Neutrix connectors are used on the balanced interconnects. The Chrono b2 was inserted into three different systems: Acapella Triolon Excalibur/Audio Note Kegon Balanced amps/Esoteric X01-D2, Avalon Isis/ Edge Reference amps/Esoteric P03/D03, and Acoustat full-range electrostats/FM Acoustics amps/EMM Labs. In each instance, the Chrono b2 was initially introduced between the CD player (EMM Labs/Esoteric) and the preamplifier and in each case compared against known references, primarily Nordost Valhalla, William E. Low Signature (Audioquest), and Jorma Prime. Each of the comparison cables was significantly more expensive than the Chrono, ranging from $10,500 to $4330. While a number of reference CD’s were used, the ones most frequently in play were the FIM Reference Recordings Vol. 4, the Mobile Fidelity SACD of Patricia Barber’s Companion and Ry Cooder’s Mambo Sinuendo (Nonesuch). Let me begin by recommending the Patricia Barber SACD which is a very special disc. While I am not generally a Patricia Barber fan, this disc is a wonderful example of what can be achieved on a properly recorded SACD. 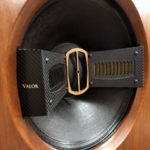 It did an excellent job of highlighting the differences between the Nordost Valhalla and the Aural Symphonics Chrono b2. Tonally, the Chrono was much fuller and richer than the Valhalla. Dynamic shading was also distinctly better. Read this as finer gradations and contrasts. 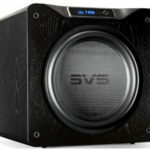 Bass simply had more power without being overblown or losing control. Speed on the small drums was excellent. The Chrono captured both the sound of the drum head being struck by the hand and the sound of the reverberant cavity. Patricia Barber’s voice was superb with the Chrono doing an excellent job of conveying the dynamic and tonal shadings. Intelligibility of voice was also superb. Soundstage was very believable with no tendency of the Chrono to move Barber’s voice forward on the stage. In comparison, the Valhalla was thinner with the midbass clearly down in level in comparison to the Chrono. The center image was less stable. Low level detail was harder to discern. The voice was nice but not nearly as textured as the Chrono. There was also some edge in the top-end and a feeling that the Valhalla was somewhat veiled in comparison, although the effect was subtle. In some rooms, particularly those with resonance problems in the 60-80 Hz region, the leanness of the Valhalla might be preferred; however, I felt that the bass of the Chrono was more accurate. The more accurate a system is, the more one will appreciate the Chrono in such a system. With respect to the much more expensive William E. Low (Audioquest) Reference versus the Chrono b2, my preference shifted from one to the other depending on the particular music that was playing. The Chrono had greater air and top-end extension but at the expense of some warmth in the midrange and upper bass. The Audioquest was absolutely unbeatable at recreating the sound of a bow drawn across the strings of a violin, viola or cello and in recreating the sound of the body cavity of the instrument. At the same time, it never seemed to sacrifice leading edge definition or truncate the decay. Staging was very natural, applause very realistic. In comparison, the Chrono b2 was somewhat less resinous on stringed instruments, somewhat less nuanced. Bass registers were very good with excellent extension. The Chrono’s detailing, while somewhat less than the Audioquest, was generally very good. Interestingly, it also played somewhat louder at the same volume setting than the Audioquest. While one listener felt that the Aural Symphonics had more midbass presence, it clearly had more life in the top-end than the Audioquest. Stage width was excellent. Voice had good articulation and intelligibility, although somewhat less than the Audioquest. The Chrono b2 did a particularly excellent job with massed female voices, and baritone was also well served. 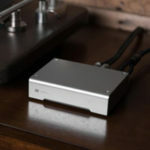 As one listener said, it did an excellent job in highlighting the one weakness of the Audioquest – ambience retrieval and top-end extension – where the Aural Symphonics was superior to the Audioqust. On the other hand, the AS’ string bass was nicely controlled but not quite as controlled or deep as the Audioquest. Articulation of female voice was also somewhat better on the Chrono but at the expense of some richness. Tenor sax had a nice reedy quality. Leading edge has somewhat more bite than the Audioquest. There is more inner detail with the Audioquest. If I were summarizing, I would say that the Audioquest sounds like a superb, multi-strand, high purity, single crystal copper cable while the Aural Symphonics sounds like a superb, solid core, high purity silver cable. Last, but certainly not least, I inserted the dark horse, Jorma Prime, which sells for almost nine times the price of the Chrono b2, a little less than twice the price of the Audioquest, which has less than ten dealers in the US and is virtually unknown to most US audiophiles. Why bother? 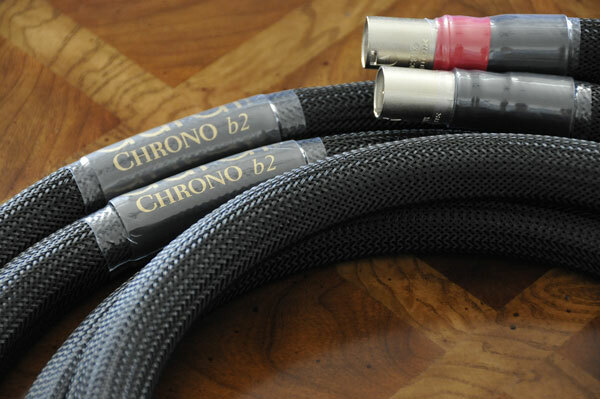 Because the Chrono b2 is good enough to be compared against what I consider to be the best wire products available. The Aural Symphonics and Jorma Prime are voiced very differently. The Jorma has a natural warmth and richness in the upper bass through the lower treble that gives a very realistic body to stringed instruments, as well giving struck instruments air and articulation. Size and placement of instruments on the stage is quite believable. The Jorma is virtually perfect in the midrange. Struck bells have somewhat more presence on the Aural Symphonics but with a slight thinness not present with the Jorma. While the Aural Symphonics does an excellent job of separating the voices in a massed choir, the Jorma is equally discerning but again richer and somewhat better at catching the interplay of different voices. The AS is equal to the Jorma in recreating ambience but has a slight edge or bite. Bass is again close but with the Audioquest clearly superior to either the AS or Jorma. The reedy sound of a saxophone is a touch more prevalent on the AS than the Jorma. All of these wires are excellent. The Audioquest was superior to the others from 400 Hz down where it is richer and better controlled, the Jorma from 400 Hz through the lower treble, primarily because of its ability to convey the richness and warmth of the real thing while not sacrificing detail or articulation, and the Aural Symphonics Chrono b2 in the upper treble. The AS is very close in many respects to the Jorma below the mid treble but a touch thin and occasionally, a bit bright in comparison. In the upper reaches, the Aural Symphonics holds its own against the best and probably does have the most extended and airy top of the three, but at the expense of an occasional hint of brightness. Given its pricing in relation to its high level of performance, the Aural Symphonics Chrono b2 is clearly a best buy and a solid recommendation. I would probably never have had the opportunity to listen to the Chrono b2 had the manufacturer not generously offered to loan me a 30′ pair for a planned series of speaker reviews. Why 30′? My primary speaker, the Acapella Triolon Excalibur, weighs approximately 1250 pounds a side and cannot be easily moved out of the listening room or even to the side. However, one advantage of my dedicated listening room is that that it is possible to set up systems at both ends of the room, and moving just the amps seemed feasible given an interconnect long enough to span the room and neutral enough not to unduly prejudice the sound. A potential problem was the reality that many cables that do exceptionally well in short runs sound different in longer lengths. In this instance, I compared the long run of Chrono b2 to the 1-meter pair which were used in the review. While there was a minor flattening of the soundstage, a decrease of harmonics in acoustic instruments and room cues, and a subtle loss of low-level detail, all other performance aspects were there. Bass was clear and present, nothing was “wrong”. Clear and neutral, but just couldn’t quite nail those micro-details, which isn’t necessarily surprising at the 10m length. I repeat the story only to make the point that a cable which performs well at a 30′ length is likely to be exceptional at shorter lengths.